When a SpaceX booster is landed, we are used to seeing soot deposited all over it, usually in a specific pattern. You can read more about that in this question: Why the strange bands of soot of the landed F9 first stage? Now that the first Falcon Heavy launch is complete, we see that the nosecone has quite a bit of soot on it as well. 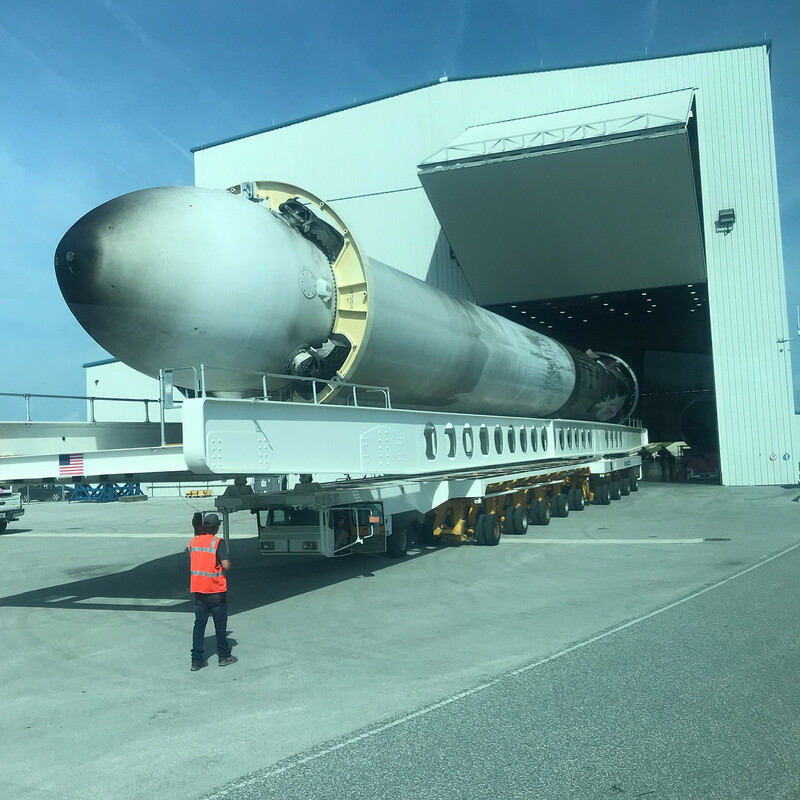 You can see it in this image of one of the booster cores being moved into the HIF after landing. We do know from the question On the Falcon Heavy, why are the side boosters using Ti Grid fins, but not the center core? that there appears to be aerodynamic consequences to the use of a streamlined nose cone, as opposed to the larger/longer interstage that a single stick booster landing would have its end. What is the cause of this soot pattern? Looking at it I would expect one side to be charred too but it may not be - the nose cone is afaik composite (same as the interstage) and not metal. Not the answer you're looking for? Browse other questions tagged spacex landing falcon-heavy reuse or ask your own question. Why the strange bands of soot of the landed F9 first stage? Could a Delta 4 Heavier be built? Why does the video feed always fail during Falcon 9 landings? Is the BFB/super heavy likely to have an easier time landing than the Falcon 9 booster?